The following Barnett Jackal review was written by Thomas Lipsey. All assembly hardware (including bolts, keys and screws) is found inside the package. The riser is made of aluminum, so it’s light and should last for tens of thousands of shots, unless accidentally dry fired. Fore-grip is quite comfortable to hold and helps keep fingers away from the flight rail. Total length is 35.5″ – quite short for a compound crossbow. Shoulder rest is fine, though I would have preferred for it to be just slightly wider. I like the quad limb (split) design. It looks good plus it allows for the limbs to accelerate slightly faster due to reduced air resistance. Bolt retainer is decent and gets the job done, though I can imagine I’ll need to replace it in a year or so (doesn’t seem as durable as in other, more expensive crossbows). That’s to be expected though. Anti-dry fire mechanism is a standard in the industry these days, so I wasn’t surprised about it being included in the Jackal. Overall: a well thought-out design. Looks like despite the low price, Barnett did not miss out on the details and used high quality materials. Very solid and dependable, really like the feel. Definitely higher quality than I expected in this price range. Advertised shooting speed is 315 FPS. According to my chronograph tests, it’s 308 FPS (when shooting the arrows inclued with the package). Kinetic Energy with the included arrows was 84 ft-lbs. at point blank range. Overall: for the price paid, you really get a lot. The scope is very easy to sight and it shouldn’t take more than 6-12 shots. Beginners can achieve 1″-2″ arrow groups from 30-50 yards away. Very stable and excellent distribution of weight, making it easy to hold and aim. Overall: possibly the most accurate budget crossbow I’ve ever shot. Package includes 3 Easton arrows, 20″ each, with screw-in field points (as opposed to glued-in). Arrows are very durable and did not break nor bend in the slightest even after hundreds of impacts from close (20 yard) range. 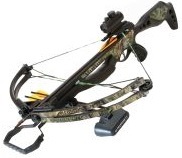 18″ arrows will also work with this crossbow, though I do recommend using the 20″ for better accuracy. Arrow quiver can be quickly detached from the stock. Package included a 3-dot sight. You can switch between either green or red dots. There’s a total of 5 brightness settings for the dots, which makes it easy to adjust regardless of weather and light conditions outdoor. The sight will hold zero very well once the crossbow is sighted – no need for constant elevation or windage adjustments. A battery is included with the sight, though you should get a spare and keep it on you at all times, just in case. Overall: a quality sight with decent optics, good light-gathering capabilities, and adjustability. You shouldn’t need to replace it any time soon unless you prefer a reticle sight. Is This Crossbow Good For Beginners? Is It a Good Hunting Crossbow? Light-weight and compact size mean easy maneuverability in the woods, a tree-stand, or a hunting blind. Accurate and easy to aim. Delivers enough kinetic energy to take the largest game in North America (including elk, cape buffalo, etc.). I’ve successfully used it to harvest a buck. A 35 yard shot with expandable broad-heads resulted in a full pass-through and a very easy-to-follow blood trail. Overall: don’t let the price fool you. The Jackal can be used for hunting just like any other crossbow with more than 280 FPS shooting speed. How Long Wil The String Last on The Jackal? I started to notice string serving separation after shooting around 700 arrows. I replaced the string, and the new one lasted a good 800 arrows. Make sure to wax the string very often (every 5 shots) and you’ll squeeze it for all its worth. Both the string and cable on the Jackal are made of synthetic materials. Where To Buy The Barnett Jackal? Other than visiting your local sports goods stores or archery pro shops and comparing prices, the next best option is checking out Amazon.com’s current price on the Jackal. There you can also read what others have to say about this crossbow in their customer reviews and make up your mind about whether to make a purchase. Good luck and happy shooting!